The 20th Annual Hawaii Forest Industry Association’s Hawaii’s Woodshow opens its doors Sunday to the public at the Honolulu Museum of Art Academy Art School Gallery at Linekona. Jurors for the show have previewed works by Hawaii’s best wood artists and woodworkers and selected winners in various categories. Hawaiian Legacy Hardwoods sponsored the Best of Show award which went to the Big Island’s Marcus Castaing for his piece, Guardians of the Heart. According to judges, Castaing’s ability to allow the gorgeous figure and curl of the koa take center stage was what made his koa cabinet stand apart. R. W. Butts from Honolulu was recognized with an Award of Excellence for his piece, Hibiscus Bowl on Stand. The work utilized bamboo in a unique and stunning way, according to the judges. Two additional awards, the People’s Choice Award and Artist’s Choice Award will be announced at the show’s conclusion on April 15. “As we celebrate the 20th Annual Hawaii’s Woodshow, all of Hawaii should celebrate the amazing talent among us,” HFIA Executive Director Heather Simmons said. “All the entries this year were particularly remarkable and I personally thank everyone who has shared their work at the show.” Simmons added her hope that visitors and residents would take every opportunity to visit the show and share in her appreciation for the hard work of the entrants, the volunteers, and the show’s sponsors. Jurors for the show were nationally-known wood artist Wendy Maruyama, artist and professor emeritus of the Furniture Design and Woodworking Program at San Diego State University; one of HFIA and Hawaii’s Woodshow’s founders, Peter Simmons, consultant, In the Woods; and Steven Hill from the University Of Hawaii School Of Architecture. Only art pieces crafted predominately from Hawaii-grown woods are displayed at Hawaii’s Woodshow as part of its endeavor to encourage and strengthen appreciation for sustainable forestry through the planting of native species. Endangered woods and certain rare species are prohibited. Many of the pieces are for sale. Anyone making a show purchase of $300 or more will have a legacy tree planted in their name by Hawaiian Legacy Hardwoods. Other Hawaii’s Woodshow sponsors include DLNR Division of Forestry and Wildlife, Kamehameha Schools, Ron and Myra Kent, Specialty Forest Products, Inc., state Department of Agriculture, Alexander & Baldwin and the Alexander & Baldwin Foundation, Halekulani Hotel, C. Barton Potter, Bubbies Ice Cream, Martin & MacArthur, and wood artist and HFIA Board President Tai Lake. 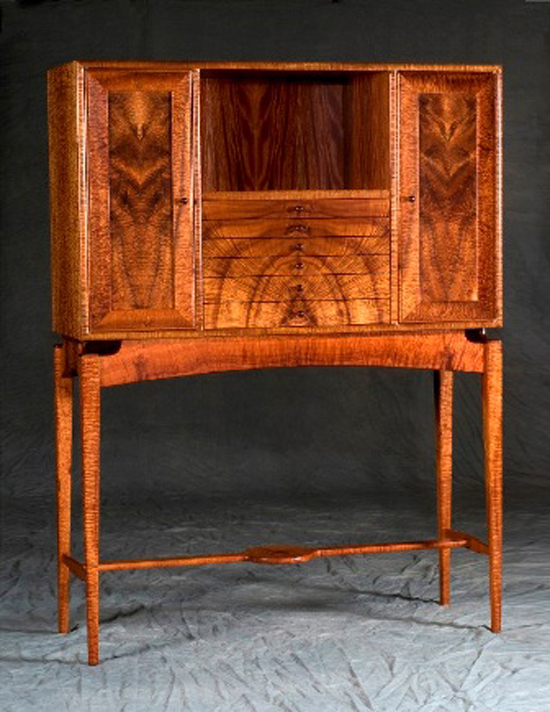 Hawaii’s Woodshow is open to the public 11 a.m.-6 p.m. Tuesdays through Sundays. There is no charge for admission.